TULARE – The first operational helipad in Tulare County surpassed the number of landings anticipated in its first year with nearly a third of those bringing patients to Kaweah Delta Medical Center for life-saving care. 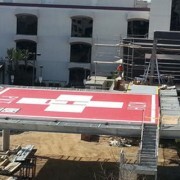 Kaweah Delta Medical Center’s helipad received 183 helicopter landings in its first year; 51 of which brought patients to the hospital for care, while 132 transferred patients out of the area to receive a higher level of care. One of the first inbound flights since the helipad began operating on June 3, 2013, brought Pete Atkins, of Escondido, to Kaweah Delta after he was injured on a horse packing trip in a remote area between Tulare and Inyo counties inaccessible by car. At the time, Atkins couldn’t walk and couldn’t get on his horse. His guide came to the rescue riding north until he got to a ranger station where he radioed for help. Not long after, SkyLife’s helicopter landed and Atkins was carried onboard. In 26 minutes, Atkins was at Kaweah Delta. The $2.7 million helipad was completed with help from $2.3 million in community donations made to the Kaweah Delta Hospital Foundation. It plays a key role in helping Kaweah Delta, the only trauma center between Fresno and Bakersfield. Since the designation in 2011, the number of trauma patients has increased over 200 percent to over 1,000 trauma patients each year.